This card is one of my all-time favorites! When I first looked at the colors in the Fall Color Challenge over at Our Creative Corner, I thought, “Ugh, those colors won’t look good together.” But, once I started putting papers together, I knew it was going to work! The card base is made with Cajun Craze Card Stock. I took slightly smaller pieces of Crumb Cake CS and the DSP, punched the corners with Ticket Corner Punch and adhered them together. Then I added a brad to each corner of the panel and adhered it to the card front with Stampin’ Dimensionals. The smaller layer was done the same way, but I added a piece of Victoria Crochet Trim to the front of it before adhering it to the card. I stamped the flower from the Creative Elements Stamp Set 3 times with Chocolate Chip Ink onto Cajun Craze CS. Then I cut 2 of the images smaller so I would have a 3-layer flower. I went over the edges of each petal with my Chocolate Chip Marker to make them stand out more and then added a few highlights with a Signo Gel Pen. The 3 pieces were adhered together and to the card front with Stampin’ Dimensionals. I stamped the label with the dots from the Four Frames Stamp Set using the rock-n-roll method in Old Olive and Cajun Craze Inks, and cut it out with the Decorative Label Punch. The sentiment was stamped in the middle of the label and then I sponged a tiny bit of the inks in the middle of it. It is matted with a piece of Cajun Craze. I just love the way it looks! Hope you do, too. 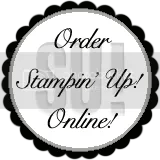 All products are from Stampin’ Up! and can be purchased from my online store 24/7 by clicking on the “Order Stampin’ Up! Online” button in the right-hand column. Here is a scrapbook page made with stamps and paper from the new Summer Mini Catalog. I just love the stamp sets in the Mini this year and want all of them!! 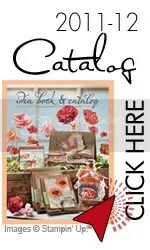 From 2011 Summer Mini Catalog – Order all of these products by clicking on the “Buy Stampin’ Up! Online” button in the right-hand column. Boy, what you can do with inks, sponges, embossing powder, and Whisper White Cardstock! This card front was originally a piece of Whisper White Cardstock (#100730 – 40 sheets of 8 1/2 x 11, $6.95; or #119952 – 12 sheets of 12 x 12 $6.95.) If you have never tried this cardstock, you’re in for a real treat! It is sooo smooth and silky. I’ve never felt any cardstock like it. The flowers (from the new Flower Fest Stamp Set #122278) on the card front were stamped and embossed using VersaMark and Iridescent Ice Embossing Powder. Then the inks were sponged all over it. After wiping off the extra ink with a piece of tissue paper, the flowers just popped! I just love making my own background papers! You can also use Glossy White Cardstock (#102599 – 25 pieces of 8 1/2 x 11 ins. cardstock for $5.95) or Shimmery White Cardstock (101910 – 10 pieces of 8 1/2 x 11 ins. for $7.95) to make this card. 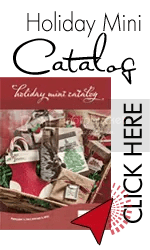 The new 2010 Holiday Mini Catalog is out! See the awesome new Halloween, Fall, Thanksgiving and Christmas stamp sets. View the designer specialty papers and check out the new FABRIC! Make your holiday cards, scrapbook pages, and projects now.